Did you know that you can find wild blackberries growing in the summer? That’s right, the forest can be your very own supermarket if you look hard enough! Blackberries will ripen in the summer and turn into a delicious looking black and purple. There is one caveat however, you need to be careful! Random berries in the woods will often make you sick, so make sure you know what you are eating. 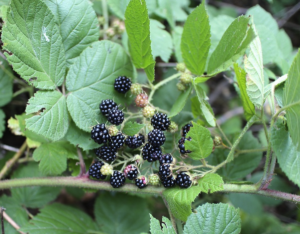 With their clusters of many smaller pods, blackberries aren’t too hard to identify, but make sure they’re actually blackberries before taking a bite. You want your foraging experience to be tasty and fun and not a painful trip to the hospital. Also found in the wild are familiar cousins to popular ingredients you buy everyday at the store. Ramps, a vegetable similar to an onion, can be found in the wild with broad green leaves, and can be pulled out of the ground. Use them just as you would onions in salads, soups, sandwiches, or caramelized and grilled. Maybe instead of a snack you need a drink to wash down the treats you found. The forest has that for you too. Young fresh pine needles can be collected and boiled to create a citrusy, piney, tea. These younger needles will be a lighter green color. The tea is tasty and a favorite among long distance backpackers. Not only does the tea actually taste good, but it is rich in vitamins A and C too, providing you with the nutrients you need to continue your hikes. Now you are not going to replace your regular grocery store trips with these tips, but try incorporating some of these wild ingredients into your dishes to add new flavors and fun to your meals! Heath and I always make a point to find something to eat when we are out exploring the woods. We bought this book awhile back and it has become one of our favorite resources!